Designed to cater to the Asian region, OPSHOM has been providing the best trading experience to all its users through the years. This binary options trading platform makes trading quick and simple. One of its most attractive aspects is its high returns of up to 300%. With its broad range of assets, OPSHOM enables users to trade a wide array of assets available. Users can trade currency pairs, commodities, indices, and equities. This online broker ensures that all its assets are stable by keeping a vigilant surveillance of new assets to be added in its index. Though its number of assets may seem limited at the moment, this platform exerts consistent efforts to add more assets for users to trade. Another plus factor for OPSHOM review would be its easy-to-understand users interface. This gives traders peace of mind, especially when using the various tools accessible on the site itself. English, Chinese, and Japanese real-time support is also available. With OPSHOM, anyone can trade using different currencies such as Euro, British Pounds, and Japanese Yen. Users can choose to trade among stocks, indices, currency pairs, and commodities. OPSHOM currently has an impressive roster of 21 stocks, 14 currencies, 11 indices, 6 commodities and a bond. Hot assets are also available for trading in OPSHOM such as stocks from Google, Disney, and Facebook among others. This online options broker utilizes three trade types, namely the Digital High/Low options, Touch, and Boundary. Aside from these types, this platform also features helpful functions like the Close Now and the Roll Over. 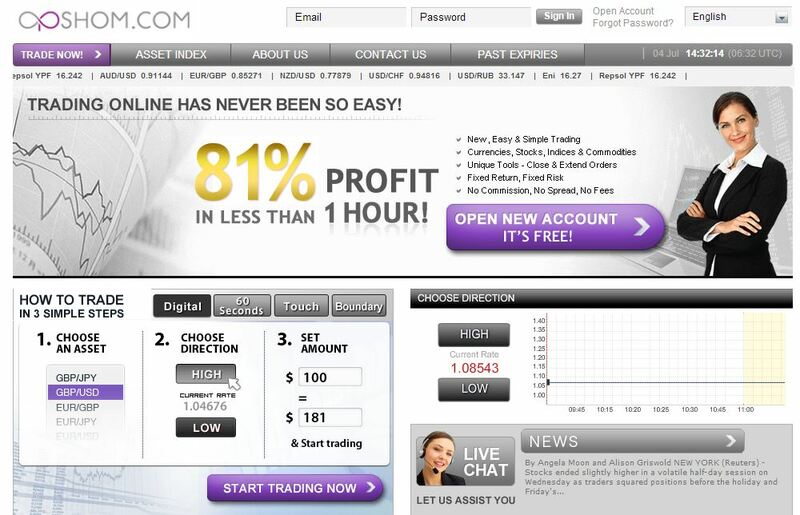 This is maybe the most interesting Binary options broker review you will find online. Close Now function enables traders to settle a trade even before the expiry time is reached. In contrast, the Roll Over function gives users the power to extend their trade’s expiry time. In addition, OPSHOM is proud to offer its users with a free e-book downloadable from their website. This gives traders some insights and strategies on trading that are useful not just for beginner but also for experts willing to learn more.